ESI Hot and Highly Cited Papers make it easy to pinpoint the most influential research in a field. For subscribers, ESI is integrated with Web of Science Core Collection, which means that you can easily identify the top-performing papers in your results via ESI icons. Researchers/Faculty: Use the refine option to quickly limit a topic-based set of results to recently published, high-impact papers in that research area. For scientists monitoring the performance of their own work, this refine option allows them to highlight their own top-performing papers. Administrators: You can identify and track your institution's full set of Hot and Highly Cited research in WoS Core Collection. Start by collecting your research using the Organizations-Enhanced tool or Address field, and then refine to the ESI Top Papers. What fields are they in? Which authors are publishing top papers? New papers may be identified as highly cited with each bimonthly update. 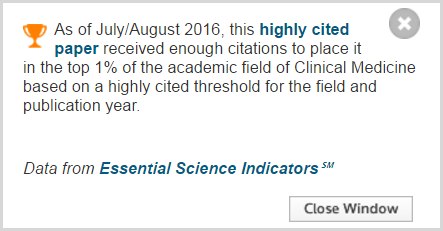 You can use ESI to identify the research fields, in which your organization is a Highly Cited Institution. This means that your institution's work in a field has accrued enough citations to place the institution in the top 1% of organizations producing research in the same field. Please visit the Learn the Basics guide for a review of the ESI data parameters. Make sure that the Results List is set to Research Fields. This is the default setting. Click on Add Filter and select Institution. Start typing your abbreviated organization name in the search box. You may need to try variations to find your institution. Once it appears in the dropdown menu, click on the name to add it to the filter. If your institution does not appear in the menu, this means that it is not a Highly Cited Institution in an ESI field. You may still have Hot and/or Highly Cited Papers in an ESI field, which are discoverable in WoS Core Collection. 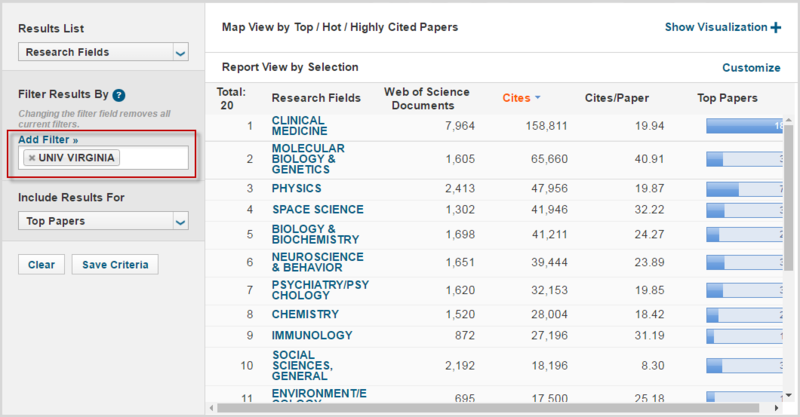 The Research Fields shown in the data table are the fields in which you are a Highly Cited Institution. The table shows you the number of papers an organization produced in that field within the ESI dataset, the number of citations those papers received, cites per paper for that set, and the number of Hot and/or Highly Cited Papers in that field. After identifying these ESI fields, you may want to compare your organization to other Highly Cited Institutions in the same field. Change your Results List setting to show Institutions. Click on Add Filter and select Research Field. Cl;ick on the + to add a Research Field to your filter. You will see a list of all Highly Cited Institutions in this field. To find a specific organizations and view its rank, hover over the Institutions heading in the data table, and click on the downward arrow to open additional sort and filter options. Click on Filters in the menu. Start typing your abbreviated organization name in the search box that appears. The list will automatically filter as you type. Click anywhere on the page to minimize the filter menu. Now you can see how your organization compares to other top-performing institutions in the same ESI field. Example: Based on total cites, University of Virignia ranks 207th out of 805 total Highly Cited Institutions in the field of Environment/Ecology. Click on a column heading to view your rank based on that indicator.